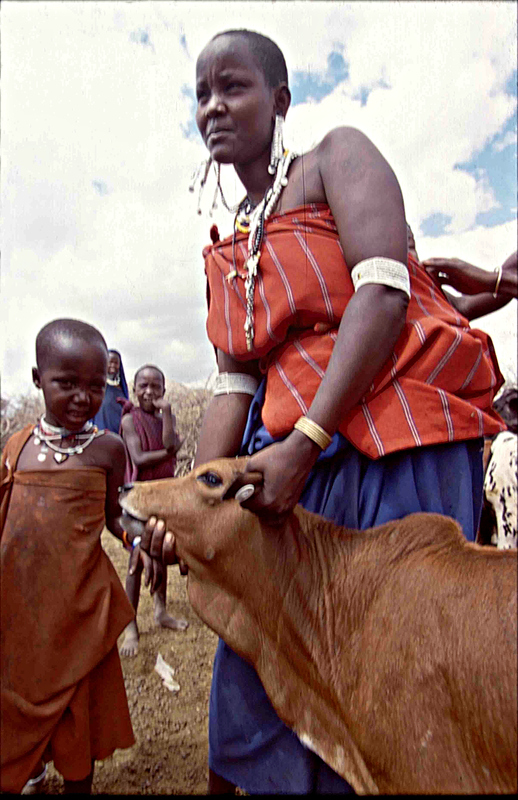 A Maasai woman holds her calf that has just been immunized against East Coast fever (photo credit: ILRI/Stevie Mann). ‘Could vaccinating cattle get more girls into high school? ‘That’s the intriguing prospect suggested by a new study of Kenyan cattle herding families in the journal Science Advances. But even more significant than the actual results of the study is the fact the researchers would even think to investigate whether there’s a link between cattle vaccination rates and girls’ high school attendance. ‘That kind of thinking is not typical, says study co-author Thomas Marsh, a professor of economics at Washington State University. . . .
‘Raising cattle and other livestock is the primary source of income for millions of poor people across eastern and southern Africa. And prior research has established that when herders vaccinate their cows against, for instance, the tick-borne disease East Coast Fever—the leading killer of calves in the region—they get more milk from their herd. But Marsh and his collaborators wanted to know more: What was the impact of the increased milk production on herders’ incomes. And how did they spend any extra money? . . .
[E]ach increase of 10 percent in the share of a family’s cattle that was vaccinated was associated with a 0.8 percent increase in the likelihood their daughters attended secondary school. . . .
Read the whole article in NPR’s Goats and Soda by Nurith Aizenman: What does vaccinating cows have to do with a girl’s education? 14 Dec 2016. Read the science article in Science Advances: Livestock vaccinations translate into increased human capital and school attendance by girls, by Thomas Marsh, Jonathan Yoder, Tesfaye Deboch, Terry McElwain and Guy Palmer, 14 Dec 2016. ‘. . . For the 50 million [African] pastoralists, livestock play an even greater role. Livestock productivity for pastoralist households is constrained by multiple factors, including infectious disease. East Coast fever, a tick-borne protozoal disease, is the leading cause of calf mortality in large regions of eastern and Southern Africa. We examined pastoralist decisions to adopt vaccination against East Coast fever and the economic outcomes of adoption. Households directed the increased income resulting from East Coast fever vaccination into childhood education and food purchase. These indirect effects of livestock vaccination provide a positive impact on rural, livestock-dependent families, contributing to poverty alleviation at the household level and more broadly to achieving SDGs. . . . The current ECF vaccine is far from ideal: It requires a continuous cold chain, it is expensive relative to other livestock vaccines, and, as a live vaccine, it can itself induce severe disease, requiring post-vaccination antibiotic use. These characteristics may be a disincentive for both commercial providers (because of the requirement for cold storage) and pastoralists (because of cost and availability). Consequently, development of an improved ECF vaccine may markedly amplify the direct and indirect impacts observed with the current vaccine. . . . The research was conducted with a grant from the Global Alliance for Livestock Veterinary Medicines (GALVmed) and funded in part by the Bill & Melinda Gates Foundation. Read about ILRI’s work to develop an improved East Coast fever vaccine. Tags: BMGF, GALVmed, Girls, Washington State University. Bookmark the permalink. Reblogged this on Mohammed Bello Tukur.